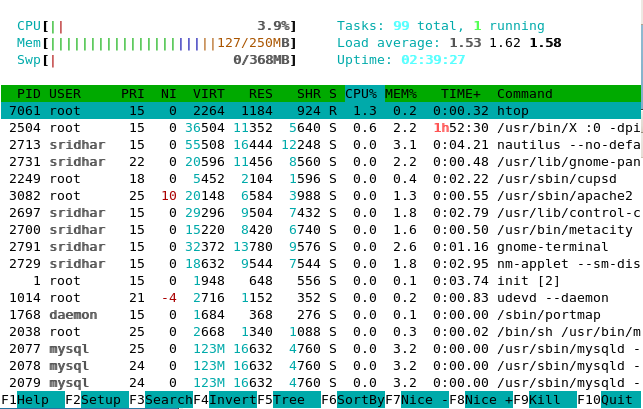 htop is a very competent interactive process viewer for the shell, providing all the functionality -- and more -- that the top utility does, in an easier and more intuitive way. htop provides easy-to-use menus for most operations and also has support for using a mouse. htop is an easier to use and friendlier version of top. While it hasn’t as much time behind it and therefore is less tested, it seems to work very well both locally and over SSH, and it’s well worth taking it for a spin. It’s just one of those small utilities that makes life a bit easier. In ‘htop' you can scroll the list vertically and horizontally to see all processes and complete command lines. In ‘top' you are subject to a delay for each unassigned key you press (especially annoying when multi-key escape sequences are triggered by accident). ‘htop' starts faster (‘top' seems to collect data for a while before displaying anything). In ‘htop' you don't need to type the process number to kill a process, in ‘top' you do. In ‘htop' you don't need to type the process number or the priority value to renice a process, in ‘top' you do. ‘top' is older, hence, more used and tested. Thank you for a nice article, htop is realy very nice and more user friendly. It is so useful tool, I was using ps aux previously, that was so hard! Dude, you saved my life, today i read the best article of this year!.